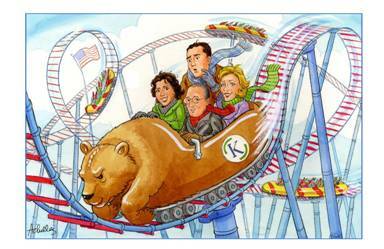 Every year I am requested to illustrate a birthday card that Kohlhepp Investment Advisors sends to their clients on the client’s birthday. This year the idea of a hot air balloon ride was suggested, and as always I draw the five principals at Kohlhepp involved in the scene. before painting the finish, below, in acrylic washes on illustration board, with a charming birthday wish inside the card. I learned some interesting things about copyrights when I illustrated a New Year’s card recently for one of my clients, Kohlhepp Investment Advisors LLC. Kohlhepp is a family business and I’ve been drawing the staff for years doing funny things to ring in the New Year – riding a roller coaster economy, holding up a crumbling debt ceiling, almost falling off a fiscal cliff. This year, with the economy looking up in so many ways, they wanted to play on the upcoming Olympic games and have an upbeat drawing of the family members eagerly piling into a bobsled for a race. 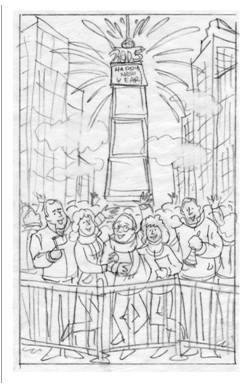 I drew a pencil sketch with the younger members of the staff taking off, with Ed Sr., the patriarch of the family, coaching them from the crowd; then went on to a color-pencil rough color sketch. I agreed with the staff that Ed sank too much into the crowd in this composition, so I moved him out of the crowd, coaching them from the left with a stopwatch in his hand. At this point daughter Mary Beth asked if I was sure it was ok to draw the Olympic rings on the wall – could that be a copyright infringement? I had to check into it, and she was right, the Olympic rings, or anything even looking like the well-known five interlocking rings, is copyrighted by the International Olympic Committee. We came up with an alternative: how about putting ‘Pyeongchang 2018’ along the wall? Looked it up – no, that too, as well as Sochi 2014 and Rio 2016, is copyrighted by the IOC. Upon further reading, I learned that the IOC is particularly aggressive in suing entities that appropriate their brand – in fact, they even filed suit against the first Special Olympics for using the word ‘Olympics’, until public backlash forced them to withdraw it. However, I can understand now why the IOC can be so particular – the companies that do become ‘Olympic sponsors’ pay an awful lot of money to be officially affiliated with the brand; and if organizations who are not an official sponsor start using Olympic branding to suggest that they are, that dilutes the value of the sponsorship of the officially designated companies. We did not want to run afoul of this entity, obviously, so we came up with the idea of putting international flags – which are not copyrighted – along the wall. I drew the final art and I think the result still implies a famous sports event without treading on any legal infringement. The people who work diligently at Kohlhepp Investment Advisors, carefully planning their clients’ savings, retirements and investment portfolios, like to kick back every year and go a little crazy with their New Year’s greeting to their colleagues & customers. This year I think they outdid themselves. 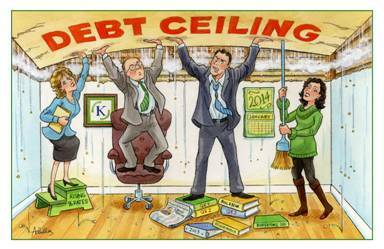 When Mary Beth Kohlhepp calls me to suggest ideas for their New Year’s company greeting card, it is always a fun conversation – she tries each year to tie the illustration I draw on the front of the card to something going on in the financial world at present. But she also puts a wink into the idea somehow, usually in the form of inserting the whole Kohlhepp team into the art as well. 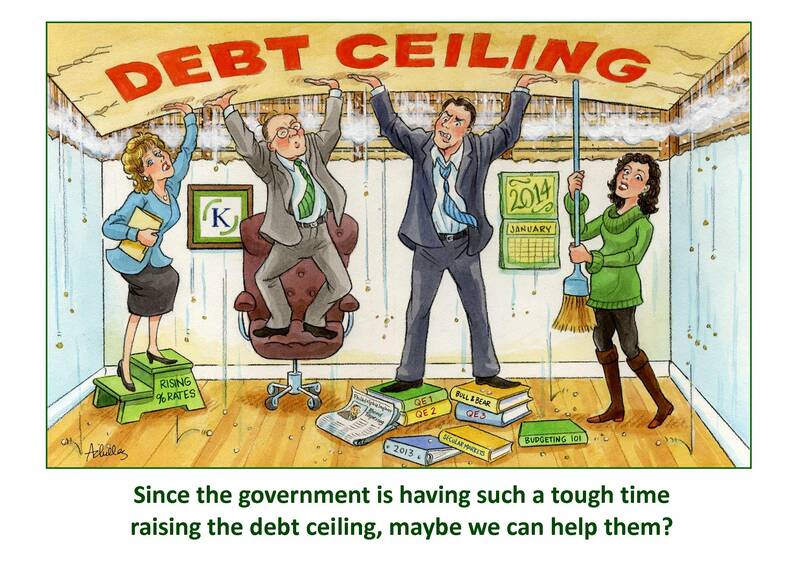 So in the past we’ve had Kohlhepps riding roller coasters, hanging by their fingernails off the Fiscal Cliff, and holding up the debt ceiling; this year had to surpass their illustrious past. The team liked the battle scene best, and suggested I keep the villain looking like the current nemesis, Kylo Ren, instead of an actual bear. I resketched it to follow their direction, added some droids and a wounded storm trooper to fill in the battle a bit more, and tightened up the likenesses of the team. I then made a color sketch with markers & colored pencils. I found that the most effective way to get the light sabers & their glow, when the rest of the background was so dark, was to put them in through the computer – no white paint could get the raw whiteness as well. It worked out well that Ren’s lightsaber glows red – in financial terms, red is the signal for evil! I used the same computer-assisted lightsabers in the finished art, but the rest of the art is done in acrylic paint, with water added so they flow like watercolors, some gouache and prisma pencil, on illustration board. Mary Beth added the perfect tagline as a caption. 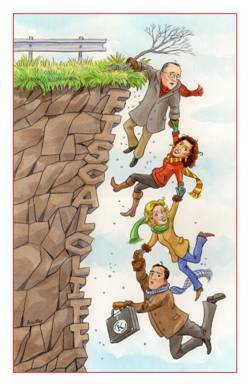 I’m very pleased to create a New Year’s greeting card each year for the team at Kohlhepp Investment Advisors, a congenial and successful family run business that guides its clients through every conceivable financial challenge to accomplish their dreams. The Kohlhepps choose to do a New Years card, mailing them out the first week of January, because the idea of financial planning makes sense with the start of a new year and the mad rush of holiday cards is now over, making their greeting more memorable. – because in an illustration, anything is possible! 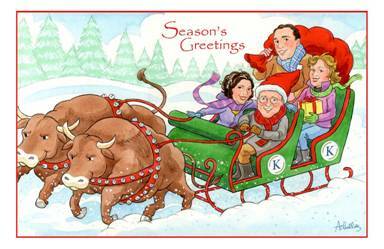 The Kohlhepps also put the finished card image on their Facebook page after the card is mailed out, to make sure all their followers get the message. Scroll down this blog to see other cards in the series. And more is coming in the next post. 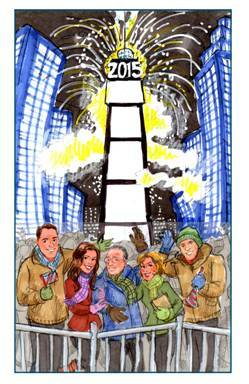 Kohlhepp Investment Advisors is a family business for whom I have drawn custom cards for a number of years. They always come up with a timely idea that their clients and colleagues get a kick out of, relating to the prevailing financial climate. 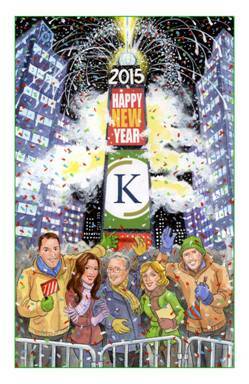 Instead of the standard holiday card, Kohlhepp has settled on doing an annual New Year’s card – which seems apropos to kick off their clients’ new financial cycle. This year’s card just went out, and focused on an issue that seems to always be creeping into the news lately . . . I drew this illustration with prisma pencil, painted with watered-down acrylics. Kohlhepp always provides me with great photos of their team so I can get a good likeness of everyone. I’m so glad they approved the funny expression on Ed, Sr. (on the chair)!